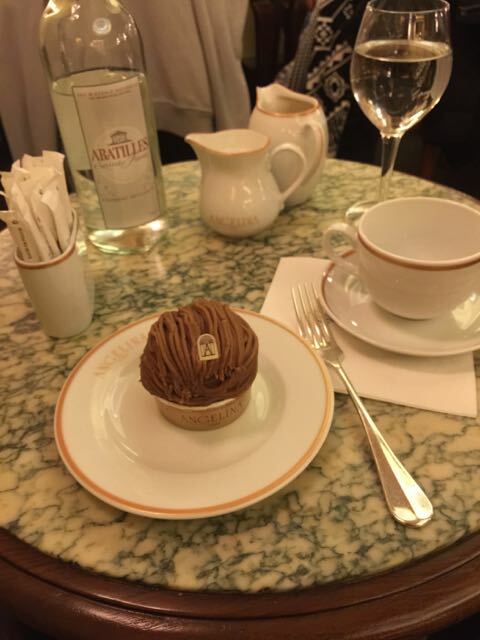 Having been justly castigated and reprimanded on FB by Nicolas for having settled for a profane simulacrum of the real Mont Blanc at the Cafe Richelieu in the Louvre, I have resolved to cast aside the cloying substitute and seek the incomparable original. So I have now come to the temple of the Mont Blanc, Angelina. Alas every tourist in Paris has had the same idea (who has been spreading my FB posts ?) so I am at the back of a long and apparently stationary queue. But eventually, I get in. After even longer a waitress deigns to take my order. So finally. Et voilà. Le veritable Mont Blanc. Darren is both excited and nervous. Today he is finally off to the Louvre. Please pray to the little god of short queues that he will get in the same century and to the medium god of sense of direction that he will find his way out again. Do message with any suggestions as to what he should see. But please don’t say Mona Lisa. He has heard of that already. After queuing for about an hour to get in, I followed a sign for the winged victory of samothrace that I thought pointed to the Greek statue department. I saw many Greek and Roman statues but of winged victory there was nothing. It turned out the sign was actually pointing achronologically and ageographically to the Italian painting section. So, after admiring the superb samothracean statue, I saw much Italian painting but was smitten with the Spanish, especially Zurbaran and some others de cuyo nombre no quiero recordarme (thanks Cervantes). I was then near the Mona Lisa so I joined the thronged hoardes to sneak a glimpse. By then I craved coffee and wandered for a seeming eternity to try to find a cafe that offered hope of permitted entrance and perchance a seat. The one I finally found was in the bowels of the earth with no mobile reception. FB promised that I could post offline. Which indeed I could. It did not promise me that it would then eat and erase all trace of my carefully composed words. Which indeed it did. Making better progress – seen the two special exhibitions and particularly bowled over by Poussin. Need more restorative rest and then I will tackle Middle Ages and Egypt. In that order. After that I will probably have had enough. Moving on dear friends your humble servant is assaying the restorative powers of the Mont Blanc – Nicolas having reminded him last night of this patissier delicacy which is as it happens extraordinarily popular in Japan. It is a cake so reimagined that it basically contains no – well – cake. Embodiments vary but they mostly contain little more than cream and sweet chestnut paste and, in today’s case, meringue. Overheard in the Louvre – viewing through a magnifying glass a paten with an exquisite enamel central boss depicting a last supper scene with Christ and the Apostles in which bread and fish are symbolically displayed on the table. Him “what do you see” Her “a whale and some angry guys”. So dear friends. I could do no more without a break as my eyes ached from peering at tiny mediaeval things. But I am determined to see some Egyptological stuff so I have come outside for a break. Send me your strength that I may manage another hour or so. They promised me that I can come back in with my ticket. I hope that they tell not the pies of the porky variety. The end is in sight because even if I don’t expire the museum will close shortly. Done 19 rooms of Egyptology (one floor) and one more floor – I think 10 more rooms – to go. So dear friends both I and the museum have expired together. It starts closing from 5.30. I think I saw the whole Egyptological part. And just when I thought my eyes could no more, I spied a hoarde of Roman silver (apparently from a villa near Vesuvius) that would not look at all out of place in my silver collection. I have no idea what to do now. Is a second restorative Mont Blanc out of the question? I knew it anyway but in 6 hours at the Louvre one can see practically nothing. I feel like the marine iguana throwing himself into the frozen ocean to grab morsels of (cultural) lichen before, nearly overwhelmed, dragging himself back to the rocks to recuperate. So on Easter Day it was time for suggestion number 2 from Andrew - Ma Bourgogne. Also conveniently close to my hotel (are you seeing a pattern?). Packed but they squeezed me into a nice little corner table. 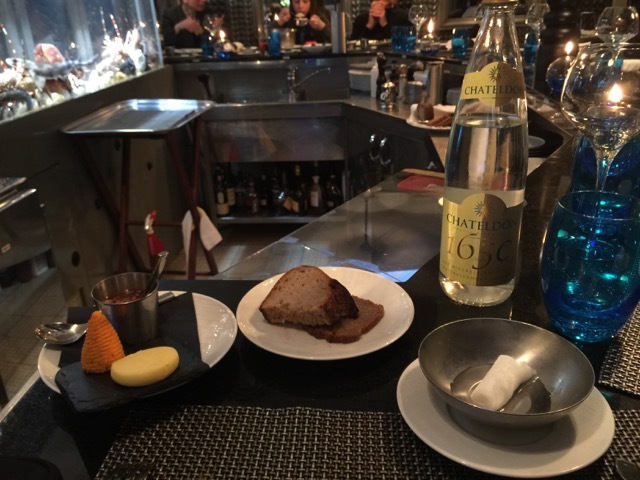 Ordered safe starter of foie gras de canard but the main course is a sausage of unknown composition. I am sure it will be fine. I’ll let you know. So the sausage gamble paid off. Still no idea what it was made from. Except it definitely contains pistachio nuts. 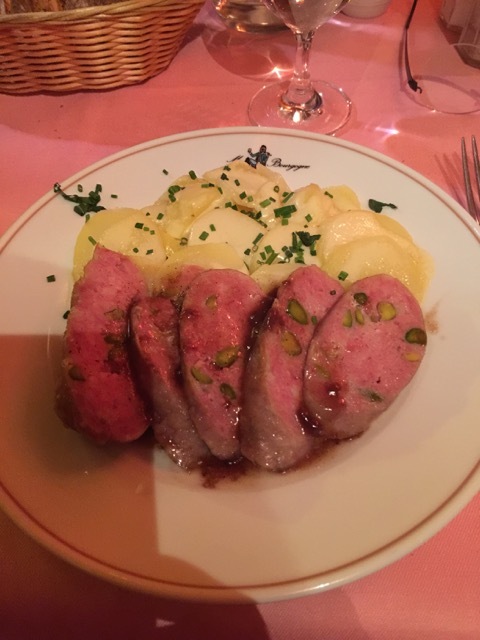 Oh it is called Saucisson chaud du beaujolais, but that is a new one on me. Here is a picture anyway. 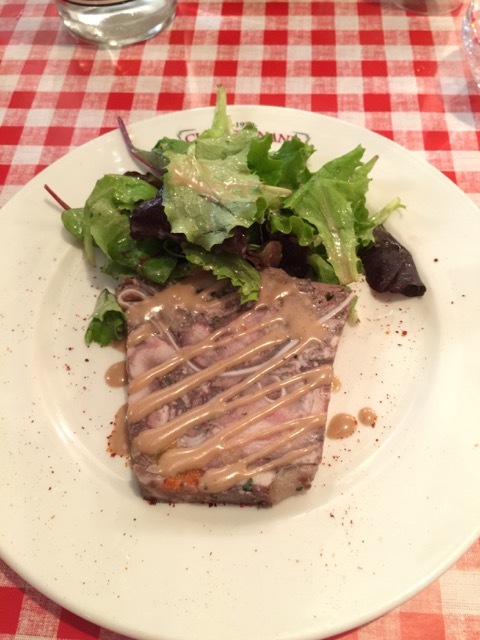 A kind FB informant tells me it is pork also called “cervelas pistaché” a specialty from Lyon. And well worth it. And also, I was reliably informed by my FB observers, a much better choice than the andouillette, which I contemplated but rejected. So tonight cheese but no dessert. (Apologies still have not managed the full four courser). A question. 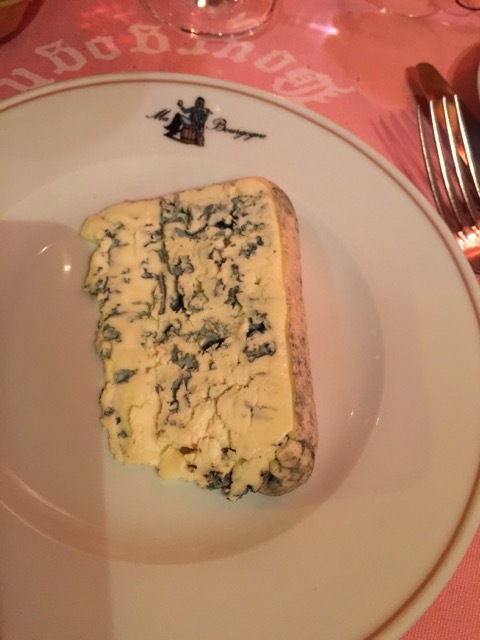 Why do lost french restaurants offer cheese singly rather than an assortment? Anyway I went for a new one on me. Bleu des Causses. I was hoping for something very strong but it was surprisingly mild for being both blue and goat milk. It was a massive slab. Picture attached but I suppose scale is hard to see. Of course I ate it all. The restaurant was in the Place des Vosges, with a splendid 17th C vaulted ceiling. The whole square is surrounded with this portico and part of it forms the restaurant. Here is about half of one side – the restaurant part is the brightly lit bit at the end. Today, unable to decide between Notre Dame and St Sulpice, Darren is going to both – the gregorian mass at the cathedral at 10 and the solemn mass at St Sulpice at 11. Followed by the “audition” of the organ. I just about got the first piece of the audition but the second one needed some explanation from back home. The warning outside that one should attend mass and not just come for the organ at the end was, as I was reliably previously informed, not remotely enforced. So, for lunch I then took a punt. Just found somewhere that looked nice close to St Sulpice and came in. Time to live dangerously! Doubtless I will let you know how it goes. Perhaps I should not have carried the living dangerously over into the actual ordering. On the daily specials was “fromage de tete”. Again please imagine the circumflex. The nice waitress confirmed that this was indeed head, a piggy one to be precise. She then helpfully said it was a kind of terrine. “Well, why not,” I thought, even though I don’t usually get on well with odd bits of animal. Bit of a mistake. It was gelatinous and cartilaginous. And is it just my imagination or does the salad look like a green head of hair? Anyway safe next course – chicken. 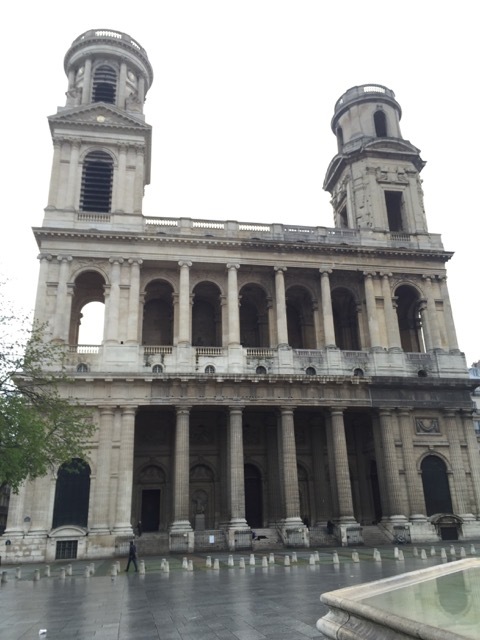 And now, time to compare organs – St Sulpice and Notre Dame. I should not really be doing it since I am not really an organ fiend, and I only heard a little bit of each and not playing comparable pieces. St Sulpice was lovely, multitextured and cuddled the listener with sound. At Notre Dame it was more like being slapped in the face. In a nice way. And I quite liked it. I think I would like to go back for more. The apparent complete absence of a music list however (I even asked but no joy) means I am not sure when would be good for a return visit. 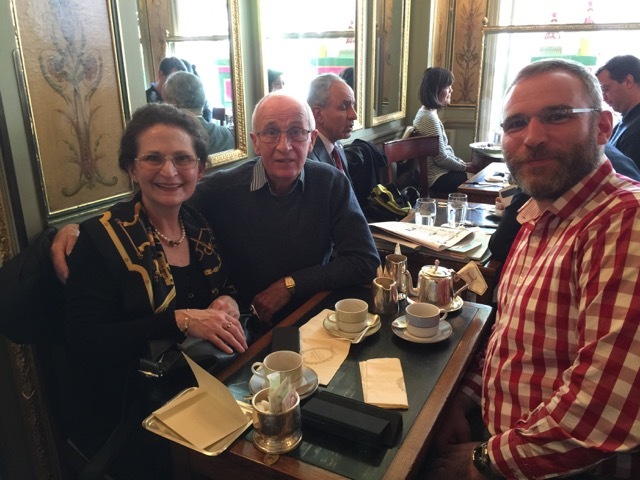 Then it was time to meet up with my uncle Paul and his friend Caroll – and where better than the amazing Ladurée – the spiritual home of the macaroon. In the meantime, I felt I had not had enough of the grande orgue at Notre Dame, and during the week they seem to use only the choir organ, so I popped back for a lovely vespers and lingered for the first half of the evening mass. Which was no less packed or solemn and choral than the morning one, although celebrated only by the auxiliary bishop of Paris and not the cardinal himself. The music was apparently identical. It was wonderful being slapped in the face by the mighty beast again. The bells were a lovely sound as well – although oddly very loud when approaching the cathedral but completely inaudible inside. Anyway, that is probably enough religion for a holiday. 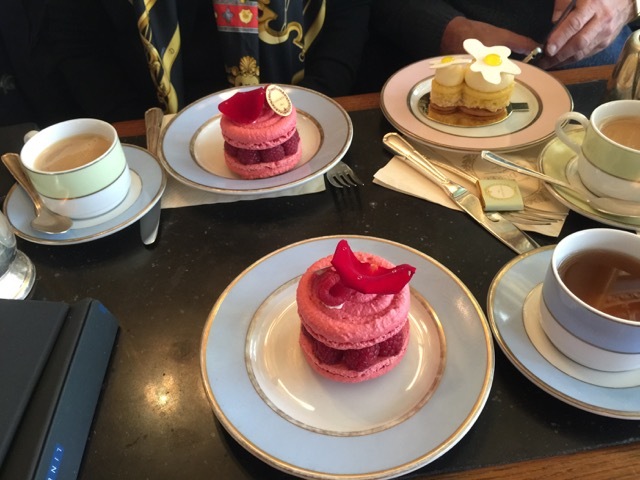 And now dear friends a word on the perils of travelling alone in Paris. When in a cafe one has finished one’s coffee and then heads to the lavatory, one naturally takes one’s valuables with one. This however signifies ineluctably to a French waiter – a breed renowned through the world for their kindness and understanding – that one is planning to scarper without paying. The said waiter therefore pursues the hapless customer into the toilets to confront him while he is still relieving himself. It’s quite annoying really. And now dear Londoners did you think that it was only on our beloved underground that you can walk so far from the entrance to the platform that you feel that you have walked the entire distance to your destination? 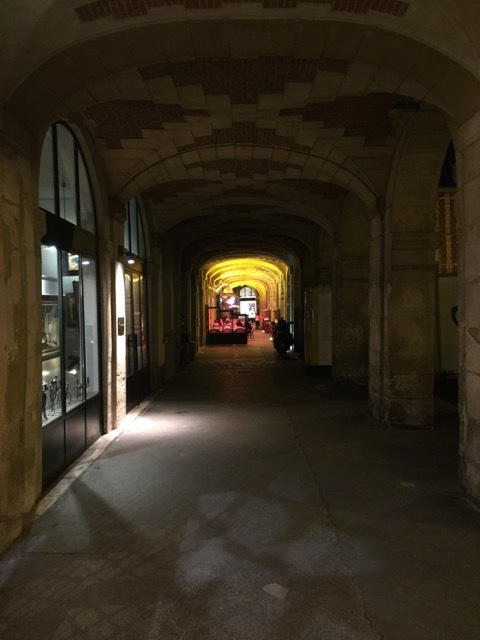 Not so – let me introduce you to Chatelet (you will have to imagine the circumflex accent) – its labyrinthine tunnels will have you filled with the warm glow of nostalgia for Bank-Monument. So discombobulated was your humble servant that he leapt on the train going in the wrong direction and has wasted a perfectly good ticket trying to repair the damage. Still, onwards and upwards. Back to the hotel for a preprandial rest. The order of service booklet for Holy Week at Notre Dame says “if you do not share our faith in the living presence of Christ in the Eucharistic bread, we ask you not to join your neighbours at communion time”. Do they really mean that communion is open to all who believe in the real presence? If they mean it is restricted to Roman and Eastern Catholics only (as I would have imagined) why do they not say so? I received several excellent suggestions for dining from my friend Andrew (you know who you are), transmitted in real time by Facebook. 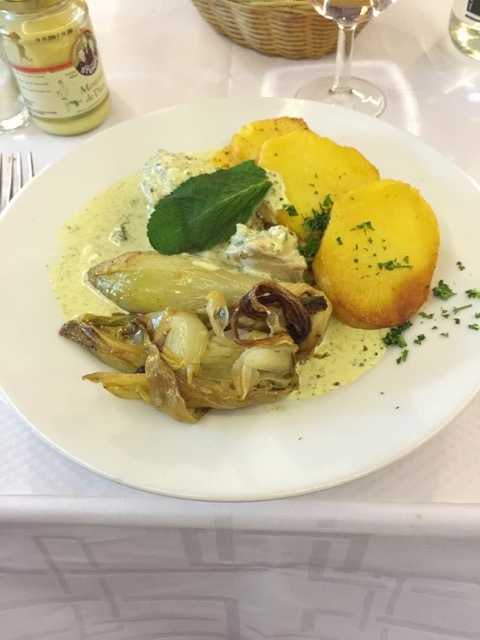 Saturday lunch was at Chez Paul, conveniently located close to my hotel, and was every bit as good as promised – with a main course of rabbit stuffed with goat’s cheese and mint. The Parisians have left for the weekend and so there are no native French speaking customers at the moment. I began my meal translating the menu from french to Spanish for the lovely couple next to me (who ordered oysters and had no idea what to do with the shallot vinegar – although to be fair they worked it out for themselves by the time the oysters came, but they did begin by attempting to spread it on bread). From a more distant table came an amusing moment at the end. No one is more sympathetic than me to the problem of French faux amis, but attempting “billet” for “bill” was never going to work really, was it? Continuing my culinary adventures, having over indulged for lunch, a more light evening meal suggested itself – so that means fish. 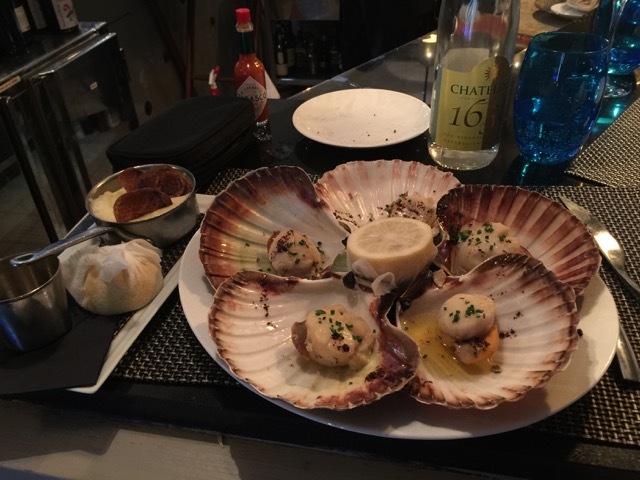 And shellfish. And especially oysters. So the Bar a Huitres, also conveniently close to the hotel, seemed to be the place. And this is what has come. 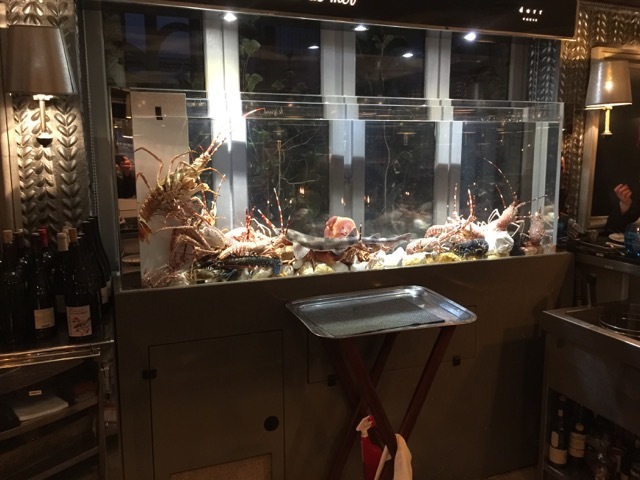 It was all stunning – my place setting both before and after the main attraction arrived – and the tanks containing I estimate several thousand pounds worth of assorted crustaceans. All illustrated herewith for your delight. Blurrily probably, but that’s how I see them myself. 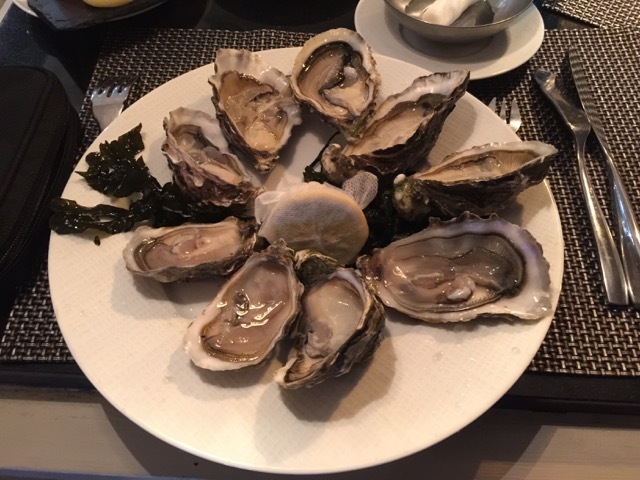 On my last night, I did not have the energy to go far for dinner, so boringly but deliciously I came back, mainly for more oysters. 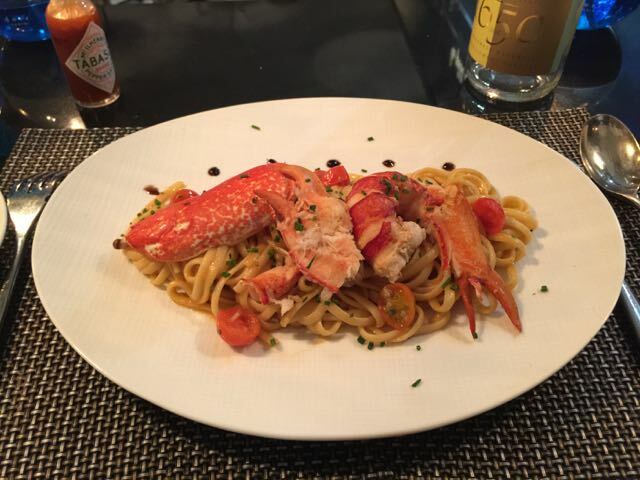 Although I had resolved by this stage to post no more food shots, the lobster linguine was so beautiful I could not resist. On a recent trip to Paris over the Easter weekend, I recorded many highlights and thoughts from my journey on Facebook, and many of my friends were kind enough to respond with comments, suggestions and encouragement. For all of them I am producing an edited version here. I started with a tour of the French Supreme Court (Cour de Cassation) thanks to a friend (Nicolas – he will feature later) of my friend Laurent who works there. 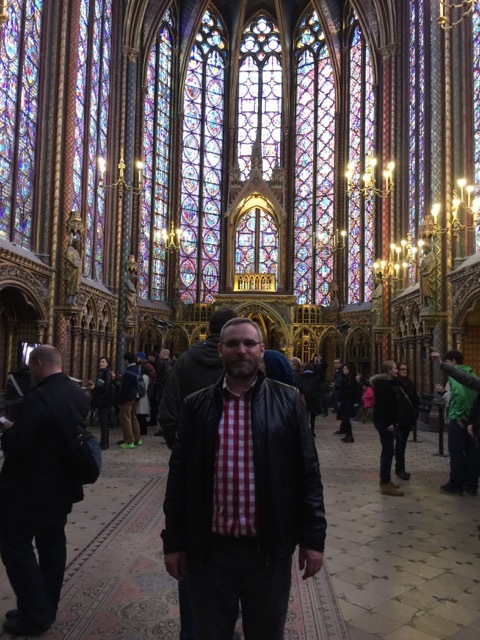 It is a splendid building in the old Palace, and handily leads directly to the Sainte Chapelle – originally built to house the relic of the Crown of Thorns, now at Notre Dame Cathedral, and which I went beforehand to venerate, it being Good Friday and all. It was amazing to venerate the actual mediaeval relic (whatever suspicions one may have about its authenticity before that) and then see the edifice that was built to house it. Then I went round the splendid Musee Picasso which has an astonishingly huge and comprehensive collection of his paintings. Definitely worth the 40 minutes queue in the rain. Then back to Notre Dame for the Good Friday liturgy, which was packed and very moving, with beautifully sung music. The next day, Holy Saturday, was one of church hopping, which was probably appropriate for the season. 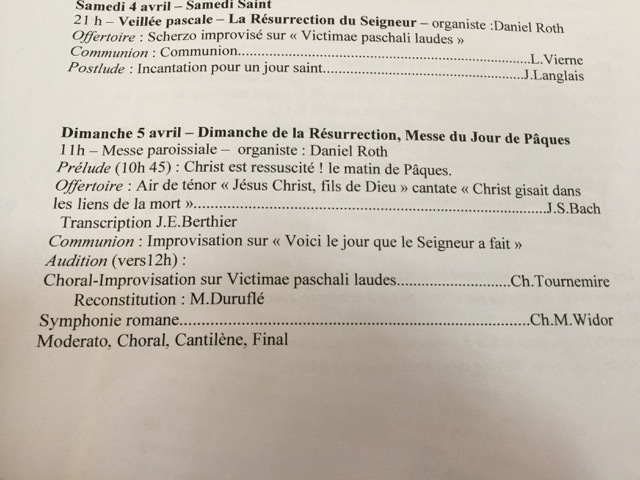 I started in Saint Sulpice, greatly recommended by organ friends of mine such as Mark (you know who you are), for Tenebrae. 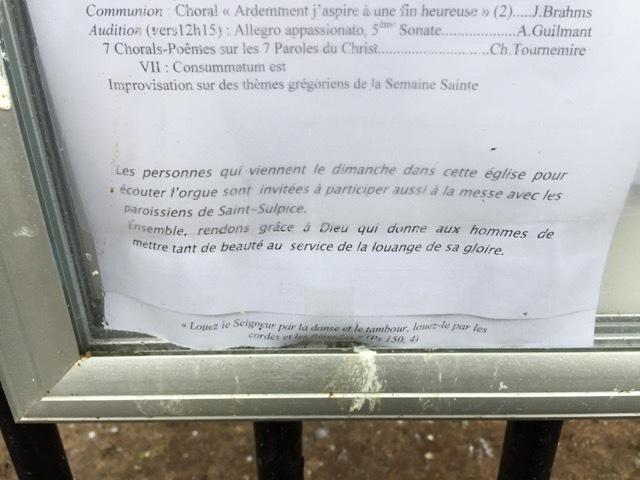 At Saint Sulpice this was a low key affair with few people but a large choir of clergy. No organ alas so I shall have to come back tomorrow. So I popped back to Notre Dame for the end of their version which started a little later. It was a little more splendid while keeping the Holy Saturday ethos. Then I dived (dove?) into the Treasury where there is much splendid tat – mostly 19th and 20th C but some ‘ancienne regime’ as well. At both establishments, Tenebrae was celebrated in the morning and by daylight – rather odd since the whole point of the symbolism of the service is that it takes place by anticipation the night before, and in the darkness, with successively extinguished candles. I am not sure what is the source of this French oddity. When I set up this blog, one of the things I said I would do with it is address Chemophobia. That is, using the word “chemical” to mean “something that will kill or at least seriously harm you” (and its cognate, using “natural” to mean “safe and good for you”). I have not done that much on it yet (although I have touched on it a couple of times here and here), but I was delighted last week to witness the creation of the Chemical-Free Bear, who in barely more than a week on Twitter as @ChemFreeBear has tackled more lazy chemophobia than most of us do in a year. He clearly hit a chord with us chemical Twitterers because he attracted more followers in a week than any mere person that I have known. If this makes you RAWR like the Chemical-Free Bear, then leave a comment below! I just had a little Twitter conversation with @OxfordChemistry, and was asked for my advice for students starting the Part II year. Twitter being Twitter, I sent off my immediate thought: enjoy it and don’t skimp on the writing up time. Then I got to thinking a little bit more. The Part II system is the jewel of the Oxford chemistry undergraduate system. Certainly back in my day (which I do acknowledge was well back in the previous millennium), Oxford was the only university where the fourth year of the undergraduate chemistry course was given over entirely to research. It was what had attracted many of us to Oxford in the first place; and even if it wasn’t, it was what we said at interview. So what do I think is the best way to take advantage of this fantastic opportunity? In many ways, I think that the question I was answering earlier this afternoon came at the wrong time. By the time you’re starting your Part II, it’s too late to make the most of it. Because surely, the most important aspect is to select the right project and supervisor in the first place. So here is my advice to those harassed third years, thinking what to do for their Part II next year. The main thing is not to rush the decision. It’s really a terrible time to be trying to decide your fourth year, when the third has enough pressures of its own. So the temptation is to rush the decision and not devote enough time to exploring the different possibilities. But you only get one Part II year, and it is really important to give yourself the best opportunity to have a rewarding and productive year. Of course it’s always more fun when the research goes well, and that part you don’t have any control over. But working with people that you get on with, and in the field that you find stimulating, that part of the deal is in your hands. Don’t necessarily go for the position that you think will look best on your CV afterwards, or is the place that you think you ought to go to. You’re likely to be much happier, and therefore perform much better, if you choose it on the basis of your own taste and enthusiasm. Think carefully – do you prefer a large group or a small group; are you really interested in this area of chemistry, or do you just think you should be? The only piece of advice I was given at the time was – stay within the main chemistry department, unless you are absolutely certain that the alternative is really what you want. I took that advice – I have no idea what might have happened to me otherwise. On the other hand, I’m now a patent attorney, so draw your own conclusions as to whether my advice is worth anything at all. Any case, I wish you all the best. Oh, and I do stick by my Twitter advice, if that is where you are at now! This is my sixth post on my trip to Japan, so I think that the time has come to write a final post, and then declare the subject closed for this time. My previous posts give a rather distorted view of my trip, focusing as they do on only three days out of the week that I was there. 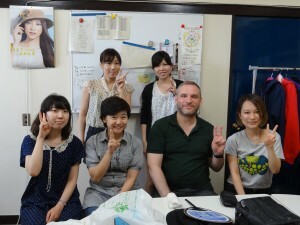 Moreover, I realise that they in fact miss out what was the main reason for my trip in the first place (which was in fact my only trip to Japan ever where the primary purpose has not been work). The motivation for going to Japan was the 60th birthday of my former professor when I was a post doc at the Tokyo Institute of Technology, Prof Koichi Mikami. The 60th birthday is a big deal in Japan, called Kanreki, because it represents five cycles of the 12-year Chinese astrological year cycle. So when I heard that the event was taking place, I really wanted to attend, both to present Prof Mikami with all my best wishes, and also to see some of my former colleagues, most of whom I had not seen since I left Japan in 1998. I have never been to such a party before, and it was a fascinating experience. In format it follows the usual Japanese course of speeches, toasts, and food. I was asked (without a great deal of notice) to make a short speech, which I tried to do in Japanese – I hope that I did not make too bad a job of it. The venue was the Grand Prince Hotel Takanawa, near Shinagawa station (Shinagawa now becoming a rather popular and lively entertainment destination). It was great to see Prof Mikami again, together with his lovely wife and and daughter, and it was also wonderful to both catch up with some old colleagues and meet some new former students. I was very interested to find out what everyone is doing now, and was most happy that another former lab member is also a patent attorney (in Japan). I am not the only one! I caught up with a few other people during my visit. I went to visit my former colleague Prof Yajima, who is now a professor at Ochanomizu Women’s University (yes, the institution of the Women’s University is alive and well in Japan). Together with some of her research students, we had a lovely tour around Tokyo, and went to see a really rather wonderful exhibition of goldfish. No, really. I never knew that the Japanese had such a liking for goldfish but it turns out that they have featured in Japanese art for many years. We saw all different kinds presented in an astonishing assortment of aquaria. With my former research student Dr Ohmura, I went to the relatively new Edo Tokyo Museum, which is a fantastic museum of the history of Tokyo (located in Ryogoku, next to the Sumo stadium) from the Edo period up until the late 20th century. We spent a good two hours there and really felt that we could have spent a lot more: there is so much fascinating material, and most of it is accompanied by excellent and detailed explanations in English (as well as the Japanese). It really greatly surpassed my expectations. After a brief detour to Asakusa to buy a replacement yukata, we ended up having a shabu-shabu dinner at the excellent Imahan Bekkan (annex) restaurant, where we were seated in wonderful cherry-themed private room. 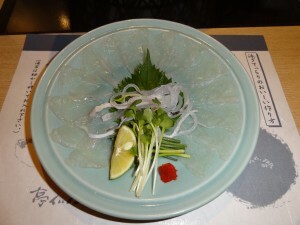 I also caught up with an old Oxford friend who now lives in Tokyo, and together we went for an excellent fugu dinner. 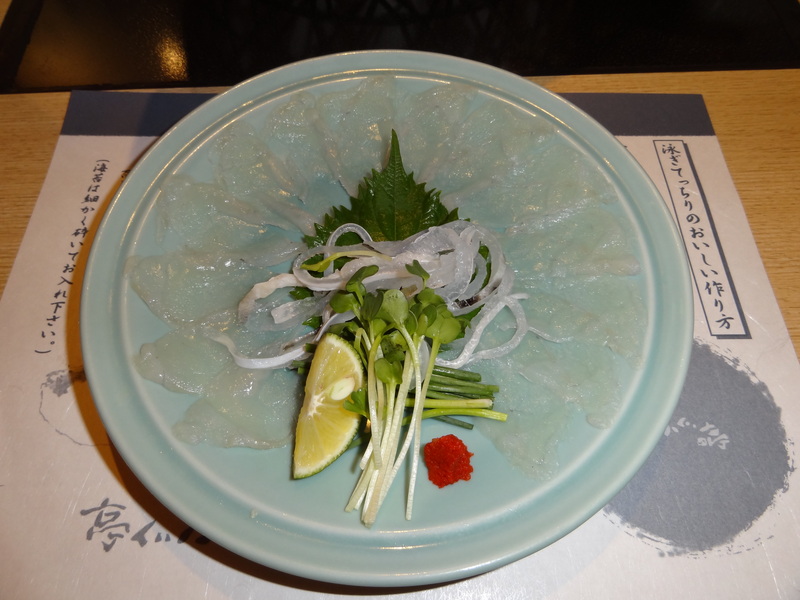 Continuing the stream of food photos, here is the sashimi course. Finally, I had always regretted that in my two years living in Japan, and in all my visits since, I have never managed to get to the English-language Anglican church in Tokyo, St Alban’s. During my normal business trips, I’m practically never in Tokyo on a Sunday morning, so this seemed like a great opportunity. So off I toddled and it was really wonderful. The clergy and congregation were so friendly and welcoming, and it seemed like half of the attendees were in fact visitors like me. Most astonishingly, I ran into somebody that I follow on Twitter, and that I had half hoped to look up when I was in Tokyo, but did not expect to find there of all places. That was a wonderful happenstance that really made my day. I should end with a comment about that most English and Japanese topic of conversation, the weather. I must have edited my memory bank, because from the two years that I lived in Japan I have no recollection of the weather ever being quite as unbearably hot and sticky as it was on this trip. Moreover, it is now fashionable in Japan to save electricity by setting the air conditioning to between 26 and 28 degrees centigrade. As I pointed out to my friends, this to me is an external air temperature requiring air conditioning, not a target indoor temperature. As a result, the only place in Tokyo where the ambient temperature was to my liking was my hotel room. Nevertheless, as I was sweltering in rooms with temperatures in the high 20s, not a few Japanese ladies in those same rooms were seeking out their cardigans to ward off the perceived chill. Temperature perception is clearly a relative matter!